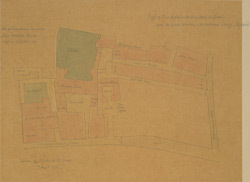 This 19th-Century tracing of a plan of Sir John Houblon's house and gardens in Threadneeedle Street is based on an 18th-Century drawing from the Gough Collection in Oxford. The plan's title appears at top right, with the boundaries of Sir Houblon's property outlined in yellow. Houblon's house became the site of the current Bank of England building, designed by George Sampson, and built in 1724.